I stumbled into this series expecting gorgeous animation with a decent story to back it up. But none of it is for shock value alone like, say, Attack on Titan. Every event has its impact, which is one huge draw of this show: The realism. Sure, the characters do use magic, and there are plenty of fantasy elements. But the realism is in the relationships, development, TACTICS (Yes, for once in an anime, ACTUAL TACTICS are used between and within every single confrontation), and world. Believe me when I say this show will pull unpredictable moments on you. And you will love it. The music and animation should not be skipped over either. The music is amazingly directed by the extremely talented Yuki Kaijura, with some songs that will be rolling around in your head for a long time to come. The second opening and ending immediately come to mind as standouts. But the animation is definitely the biggest part of the presentation, and holy hell is it outstanding. Put simply, Ufotable's "Kara no Kyoukai" series is regarded almost unanimously by the anime community as a whole as the most beautiful animated work in existence. And in this series, they somehow managed to pull off animation of the same caliber throughout this entire series without a single dip in framerate or quality. There are no extended still shots here. No cheap tricks. The CGI present is masterfully executed and blended in with the 2D in such a way that you actually beg for MORE of it. And every single painstakingly hand-drawn frame has its own soft glow lighting, reflections, bloom, soft shading, gradient coloring, and detail so crisp that you can pause at any frame in the middle of a blindingly fast fight scene and still see the tiny patterns on a character's ribbons, or the folds of the stockings underneath a character's mostly obscured boots. It's mindblowing how frameable every single shot is at any moment, and the framerate manages to stay silky smooth the whole time. Overall, Fate/Zero should not... CANNOT... be missed. If you've spent the last decade moaning about how anime has degraded into moe and harem trash, this is the show you need to watch. It will restore your faith in anime, guaranteed. And with the new Fate/Stay Night retelling by the same people underway, as well as a new film, there is plenty more Fate to keep your love rolling. Without a doubt, this was one of the best animes I have ever seen. The animation was excellent. The story was gripping, compelling, and dark. I couldn't tear myself away from it. It made me laugh and it made me cry. Yes, this story is very dark and depressing and definitely not suited for everyone, but I think that's what draws so many people to it. It's raw use of emotion pulls the watcher in and, I think, is why this show is outstanding. The characters are all very well written, as are their lines throughout the show. It's hard to pick a character to root for, since [almost] all of them appeal to you in some way. I honestly cannot think of anyway this show could have improved. It exceeded my expectations all the way to the very end. Gen Urobuchi's evocative and thought provoking story has been successfully adapted to the visual medium. With beautiful art (falls apart at the end of part 1 due to time constraints, but is redone in the DVD release) and a strong musical composition, an ensemble of memorable characters take their journey through the a dark, bleak world in an attempt to have their dreams come true. Although occasionally faltering through the need to explain complex scenarios in dialogue (making it sometimes sound like a generic Shonen anime), the anime expects a lot of its viewer, presenting characters with deep and personal motivations, fears, and wishes. A knowledge of history and mythology as well as an open mind only enhances the viewing experience, and the story and writing only encourage research to help understand and empathize with the characters. Behold, The grail awaits your wish. There are but few anime's to have such meaning behind them, such meaning that it makes you respect it in a way that can only be explained from ones own perspective, and Fate Zero is one of them, probably one of the biggest powerhouses of all time. The amount of detail in this anime is perfection, the feeling and emotion, the thrill of battle, conflicting ideologies, betrayal, the respect between knights, kings and conquerors, while in the mix of a more darker twisted side of honor, trust, and ideals. An unforgettable story that will be forever in my mind and heart. This is an anime you cherish, because they come once in a lifetime. Ufotable has earned my respect as being one of the highest quality studios in terms of animation, never have I been so immersed into a story before. The dialogue between characters; and that goes for all of them, is extremely well done, to the point where I don't have time to look at the animation, because i'm simply fixated on the story from reading subtitles. I am still left asking myself, How does one tell such a story. I have nothing but respect for everyone on this project, I cannot begin to tell you how much blood sweat and tears probably has to go into something like this. 25 episodes, and the amount of detail that went into each character during the story is untouchable, everyone is amazing during the anime and story, Kiritsugu, Irisviel, Saber, Kirei, the list goes on and on. The entire story was written by masters of their craft, to have such sophistication while being in the mix of all of the action, schemes, plots, personal lives and means of reaching their goal, this is on a completely higher level than any other anime I have seen thus far, and this is coming from someone who has seen quite a few amazing anime's. This anime left me speechless, sometimes I was left with my mouth wide open for a good minute from the story, never has there been so much shock and awe in my life, it was as if I was watching a masterpiece unfold before my very eyes. Just when you think you had things all figured out, this anime just destroys you, but at the same time it's making you feel sympathy towards these actions, no matter how horrible the outcome is, the many outweigh the few( and vice versa ) You can't escape it, but in the end, can we find such resolve? This is all being backed up by some of the most powerful music i've ever heard in an anime, it almost soothes your soul, there is nothing better than having music surround you while you're watching an anime, it makes it that much more meaningful and emotional, the feeling I get from this anime is indescribable. Again this is coming from perspective, you can see this anime however you interpret it to be. In moments I am lost and taken to another world, and experiencing another life, whenever I see characters talking in the moment, I never want it to end. The voice actors are top quality, the finest cast for such an amazing anime. I can't find anything wrong with this anime, it's basically dusting off a diamond if I were to tell you anything wrong with it, you can point it out, but it will just leave it shining brighter than before after dealing with it. This anime is for the mature viewers, and thats not just for gore and action, I mean story, and quality of exchanges between characters, if you can't accept everything within this anime, then you're watching something completely different, i'm not trying to be idealistic with my views, i'm just telling you that in order to get the most out of this entire anime is to accept it for what it's trying to show you, It doesn't matter how it ends or begins, as long as you can accept the fate of the story. If there would be an anime to remember throughout the remainder of life, Fate Zero is the one to be written in the history books. If this was the Last thing I ever watched, I would have no regrets. Fate stay night awaits me, but now I know true perfection, I know what true dedication and storytelling is, and I hope one day I can reach this level, because I strive for something like this, to experience such passion. Bravo, Gen Urobuchi, may we remember this story for years to come. If you are looking for a truly well written series with some of the most jaw dropping animation you've ever seen, then look no further because Fate/Zero is the series for you. 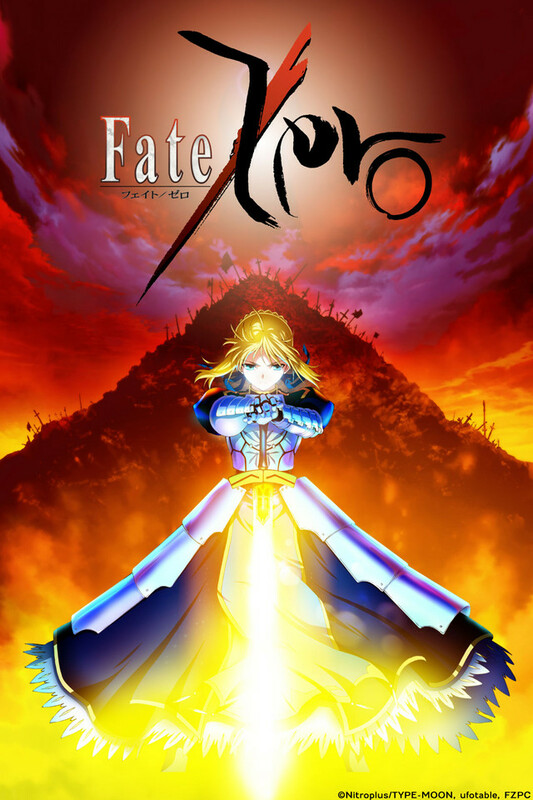 Directed by Ei Aoki at the exceedingly talented studio Ufotable and written by the highly acclaimed author/screenplay writer Gen Urobuchi (Madoka Magica, Saya no Uta) of Nitroplus, Fate/Zero is based on Urobuchi's lite novel prequel to Type-Moon's immensely popular visual novel Fate/Stay Night. Originally written by Kinoko Nasu, F/SN tells the story of a secret war between seven mages who summon legendary heroes, both historical and mythical to fight to the death in a battle royale for the Holy Grail, a mysterious relic that has the power to grant any wish of whoever acquires it, and the lengths people are willing to go to obtain it. While Fate/Stay Night focused on the tragedy of innocent kids forced in a life or death situation, Urobuchi takes it a step further with Fate/Zero's cast of morally questionable adults who will use whatever means necessary to obtain the grail. Fate/Zero is an absolute masterpiece from start to finish that is a must see for all avid anime watchers! Note: Many argue that it is necessary to read the original visual novel Fate/Stay Night BEFORE watching Fate/Zero, but Fate/Zero is a series that can be enjoyed without having read the original visual novel. Definitely read the visual novel, but also keep in mind that a brand new Fate/Stay Night TV adaptation will be released in Fall 2014, which covers the Unlimited Blade Works route of F/SN, along with a movie adaptation of the Heaven's Feel route which is set to release next year. I recommend at least reading the Fate route in the VN to get prepared for the Fall 2014 anime. It is up to you whether you decide to watch Fate/Zero before or after the new upcoming series. Mind Blowing Animation, 3 Dimensional Characters who you will find yourself attached to, complete with the writing and directing of Urobuchi Gen. This show is going to blow your mind. Fate/Zero is a prequel to the best selling Visual Novel, Fate/Stay Night,and reveals what truly went on during the 4th Holy Grail War. The Holy Grail war is a fight participated by 7 Masters, who command 7 Servants (Heroes from the past or future made legendary by their deeds) to win the Holy Grail, a holy object that can grant the winner any wish. It focuses on Emiya Kiritsugu, adoptive father of FSN protagonist Emiya Shirou, and Saber, as they go through the horrifying week that is the 4th Holy Grail War. The Animation and Art is as good and maybe even exceeding that of Ufotable's previous work, Kara no Kyoukai. Unbelievable action sequences, bone chilling OST, and characters (all the master and servants) that are more than what meets the eye. Really good plot. Characters powers and wardrobes are really great. A bit predictable in some parts but it plays well like a game of chess. It has a very unexpected ending. I can only hope that they would've added seasons to this. IT has a LOT of potential. Enjoy! I honestly can only applaud by the end of this series. Fate/Zero knows how to do things right and do them well. From the start there is the right mix of comedy, battle, sadness, and horror. To sum it up in one word, I would call this series "mature". It knows what it wants to do, plans what it wants to do, and carries it out with such quality! The characters are incredible, the music is mind-blowing, the art is fantastic, and the plot is sooooo deep. You feel the characters' pain, laughter, and tears. This will truly be one of those classic anime to go down for many, many years. This anime was definitely a great show to watch even without seeing fate stay night first. The anime has great character development, which is shown throughout the anime and makes us either love or hate each one. When you watch it you will not be neutral about the characters and you will find yourself unable to root for any character in some battles as some will have two of the characters you love fighting each other. Now also the anime is good for later leaving the viewer confused NO SPOLIERS at the end but this portrays a deep and grand message that you will most likely not get at first as it all happens so soon. The anime tries to do so much in the little time it has and is SUCCESSFUL. The characters are well developed, the women are beautiful for any guy that wants to know, the men are also pretty masculine, the combat is to die for (pun intended), the message is amazing, and the whole anime is spot on!!! I would recommend this anime to anyone that has seen fate stay night or just needs something to watch. Its really great you will not regret it in the end! Dark undertones set this anime apart from the normal shows I enjoy watching. I was surprised by how much I enjoyed the story form beginning to end. While the middle did drag on a bit, overall this show is truly wonderful and easily the best of the Fate series of anime shows.